It's roughly Undercity Huckster, and that was a playable, but nothing special kind of card. Very playable and very good. This is also a very strong Arena card for Priest and its common so you will see it alot. This seems solid and if Priest needs 2 mana cards and they dont want to play Dragons, this will work instead. Playable but needs more synergy to be good. Sort of like Dark Peddler only with deathrattle. 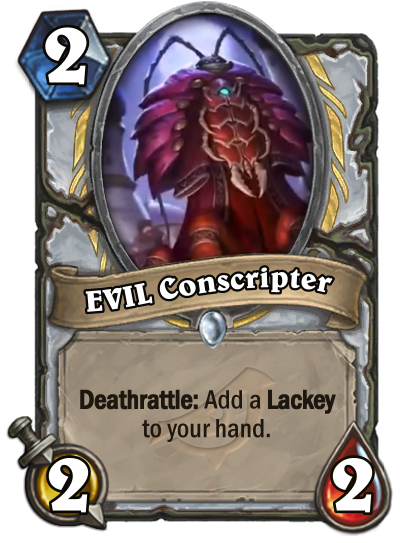 But average Lackey should be better than average 1 mana spell, so deathrattle makes sense. Decent card. That card exists. To Arena with it! Right now it's a 2/5 (rating in stars) with uncertainty of use of Lackeys in priest decks. Raafam and Togwaggle having the best synergy with lackeys. it's still early and 100 cards left to reveal so will come back to this later. Okay stats, cool deathrattle effect, likely to synergizes with the upcoming new cards. Does that mean Lackeys are afraid of cockroaches? Also worth noting is that this is a pretty decent card in any sort of Questing Adventurer miracle-style priest. That will save the priests for having to hero power on 2 with the rotation of Shadow visions and Shadow ascendant. So, even if the Lackeys are not good (for now), I think this one will still see some play. It'a a priest 2 drop which is playable, priest's turn 2 plays are rotating out (Except the trademark hero powering) this might be the priest 2 drop of choice? it looks decent. EVIL as a keyword race? Someone pointed that out on Reddit too and I'm inclined to agree. Pretty much all of Priest's 2-drop minions have been "playable/good....IF you combine it with something else" - Auchenai Phantasm, Mana Geode, Radiant Elemental, Shadow Ascendant, Shadowboxer, Squashling. This is just decent on its own. I think it could see play. no, it means lackeys eat cockroaches. Perfectly viable two drop since we’re losing Radiant Element. Nothing flashy, but fine. But do priests want lackeys? In some other classes this would be great, but I don't know if priests are going to want these guys. Priests have better things to do, like steal all your guys, quadruple a minions health, or resurrect a board of legendaries. I mean, a lackey just seems so beneath a priest.